Committed to deals: Black Friday shoppers brave lines. Long, long lines. Posted on Fri, Nov 26, 2010 : 6:56 a.m. They are the most committed of Black Friday shoppers: the deal-hungry souls who brave hours of bitter cold temperatures and precipitation to land the best bargains of the holiday shopping season. Despite a tenuous economy, some shoppers lined up for hours at big-box stores in the Ann Arbor area this morning to ensure they were able to secure the items they had highlighted on their shopping list. At Target on Ann Arbor-Saline Road, several hundred shoppers were lined up outside the store by the time it was ready to open at 4 a.m. The line stretched several hundred feet, far past the Party City store in the shopping complex. But when Saline resident Jennifer Jones and her daughter, Brittany, arrived at Target at 4 p.m. Thursday, there was no one in line. "Nobody showed up til 7," Brittany said. "We were the lone rangers," Jennifer added. Rain on Thanksgiving Day turned into snow flurries early this morning -- and temperatures around 20 degrees Fahrenheit -- but the Joneses were ready for it. Sort of. "I think if I start running, my toes are going to crack," Jennifer joked minutes before the store opened. Security personnel at Target were positioned to keep people from jumping ahead in line or rushing into the store and causing a stampede. At Best Buy on Lohr Road, security personnel and three Pittsfield Township police officers were repeatedly warning shoppers not to run into the store when it opened at 5 a.m.
"If you run, you’re going to get kicked out," a manager declared to the line. 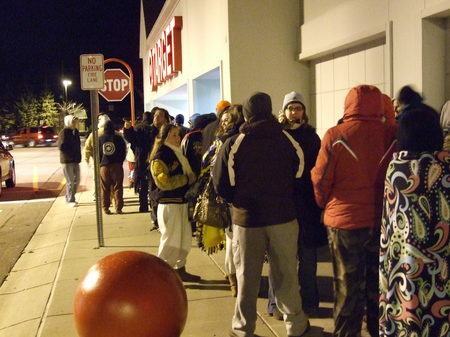 The line outside the Target on Ann Arbor-Saline stretched several hundred feet when the store opened at 4 a.m. The line of shoppers waiting to get into Best Buy stretched around the back of the store. The first shoppers in line -- a group of five cousins from Ann Arbor -- got to Best Buy at 1 p.m. Thursday. They camped out in a tent to shield themselves from the Thanksgiving Day rain. The cousins came for the deals -- not to enjoy the Black Friday atmosphere. "Much rather be in my bed right now," quipped Rajkaran Gill. Inside local stores, lines varied in length. At Kohl's, which opened at 3 a.m., the checkout line had only a few dozen shoppers by 5:30. At Target, the line stretched to the back of the store within 15 minutes of the store's opening. Not everyone had to wait long at Target, though. Three shoppers snagged 40-inch LCD TVs and were already out the door within about three minutes of the store's opening. John Van Hout of Lake Orion was standing outside Target at 4:10 a.m. with two TVs in his cart. "I’m not going to keep them for myself," he claimed. "It’s for other people." Sat, Nov 27, 2010 : 5:40 p.m.
Fri, Nov 26, 2010 : 12:22 p.m.
yes indeed, black friday is a scam, the 10 computers or tvs available at drastic discounts that more than 100 people wait in line for are called loss leaders, they lose profit on them b/c they know people in a frenzy that miss out on it will still stay in the store to buy other things. Additionally most of the box stores black friday sales flyers can be found online weeks in advanced, often if you sign up on a website they will email you additional flyers and coupon codes for additional % off. So if you know what you will want you can create and save a shopping cart (most sites save shopping carts for two weeks) than when 12:01 rolls around you can go to your saved cart the items now show the sale price and you pop in your coupon codes and often get free shipping, so you don't have to wait outside in the rain and you get it for less than those people that did anyway! major retailers often have good sales on Thanksgiving day itself online, so you get the same doorbuster item/prices. many people fail to realize that most box stores will price match a competitors price for the same item, just ask for a manager to price override at check out, you'll have to show them the ad with date on it/item/price/size etc (you can always call ahead to make sure or email customer service on their website). Fri, Nov 26, 2010 : 10:01 a.m. I now know that 'black friday' is a total scam...A coupke years ago I saw an ad that said Best Buy was selling laptops for $300, so I got up at 4:00am to snag one. But when I got there, there were about 300 people lined up already, and it turns out there were only 10 laptops! What a scam!!! Fri, Nov 26, 2010 : 8:57 a.m. I've always thought that Black Friday was really more about people feeling like they belong to something and have accomplished something challenging. And of course, PT Barnum would've been all over it. As xmo pointed out, amazon.com and other sites have long ago obviated any need for this madness. Fri, Nov 26, 2010 : 8:29 a.m. Since Al Gore Invented the internet, there is no need to go to a store on Black Friday. Fri, Nov 26, 2010 : 7:59 a.m.